I know everyone else is doing it, too, but how can one help oneself? Cuuuuute! The pattern for the monkey rattle, in both Norwegian and English, is graciously shared by Kaptein Biff. 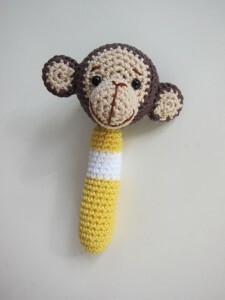 And if you can’t crochet – or can’t find your needles because you just moved – you can purchase a rattle from her Epla shop (if there are any in stock, they seem to sell the moment they are listed – but there are other designs as well, all equally cute, I might just die from the cuteness, actually).